Five historic lampposts from Point Pleasant Park that caused a stir back in the ’60s are being moved to a Victorian-era zone at the park’s main entrance. They were removed from the Tower Road parking lot in October during work to renew the park’s upper entrance. Eight new lights, outfitted with modern LEDs, will replace them. The city plans to install the lampposts near the former superintendant’s lodge and ceremonial gates marking the park entrance at Young Avenue and Point Pleasant Drive. “You don’t put the family china in the mud room,” says Edward Versteeg, landscape architect with Ekistics Planning and Design, one of the two design firms that created the park’s master plan. Although the posts were cast in 1900, they weren’t placed at the park until the late ’60s, according to Janet Kitz, author of Point Pleasant Park: An Illustrated History. The lampposts were donated to Halifax during the Canadian Centennial in 1967 by Gen. K.C. Appleyard, an affluent businessman from Surrey, England. Appleyard had been a prominent figure in Halifax with close ties to the corporate elite. He was referred to as the godfather of Halifax Development Ltd., a company that was instrumental in the creation of commercial projects such as the Scotia Square complex. Appleyard died a few months after he became benefactor of the park. “He was a very generous man,” Kitz said during an interview. A plaque to honour him is situated on one of the five lampposts, affixed by the business community and city officials in 1968. Germana believes they were unpopular because of a Scottish Lowlands trademark emblem that is clearly visible on the side of each post. Her research suggests it was known as a symbol for industrial Glasgow, which had a poor reputation during the 1960s. Larry Heighton, groundskeeper at the park, appreciates the lampposts. “They have a discreet presence like a big oak tree that’s been here for years. In the 20 years that I’ve been here, not one person that I know of has ever commented on them. Maybe they will get the conversation they deserve near the luxury of the old lodge.” The refurbishment and relocation of the cast-iron lampposts is only a small part of a master plan for Point Pleasant Park. Municipal council approved the plan in 2008 following public consultation and an international design competition. Versteeg says the decision to move the lampposts was made following public consultation and input from the Point Pleasant Park advisory committee. “There was a bit of confusion as to what is the main park entrance. Young Avenue is seen as the key ceremonial arrival point for the park. Tower Road is a more functional, secondary entrance,” says Versteeg. The tender to sandblast and recoat the posts was awarded to Mills Painting and Sandblasting Ltd. in Dartmouth. “The detail on these lamps is remarkable,” says Michael Kemp, the company’s general manager, as he traces his finger along a post’s fresh epoxy and polyurethane seal. 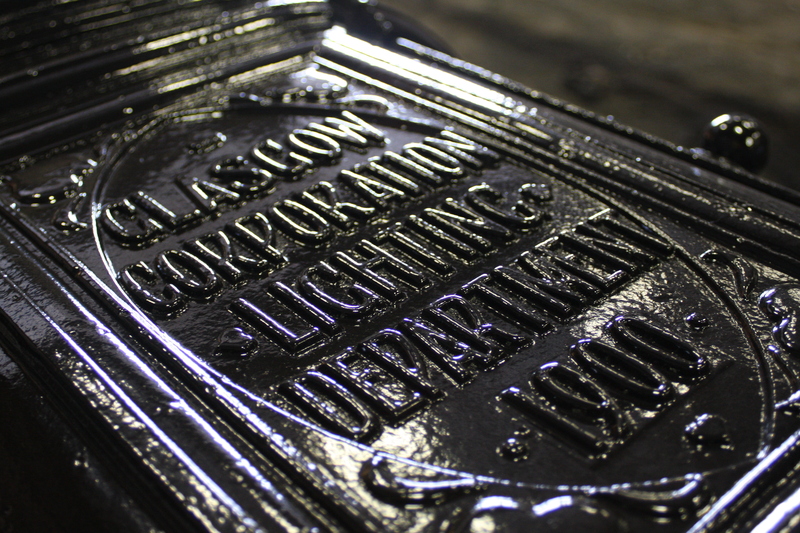 An emblem on the side of each post clearly reads: Glasgow Corporation Lighting Department 1900. Each post is 8.5 metres in length and weighs roughly 1,600 kilograms. “It’s not cheap,” says Barry Yanchyshyn, a city landscape architect. He says the price tag for refurbishing and relocating the posts will be about $100,000. Planners intend to have the lampposts settled into their new turf by the end of February. A ceremony to mark the changes is expected but the date has yet to be determined.